This is the fourth and final part in a series of posts investigating the value of a red card. Knowing the value of a red card isn’t particularly interesting in and of it’s self. If we knew that the value of a red card in a certain situation was say -0.2 goals we could say that a player getting sent off then would be hurting his team significantly, but it’s not like we need to do a long calculation to know that being sent off is generally a bad idea. However we can apply the information to answering certain in-match questions, for example when is it correct to intentionally foul someone knowing you will get sent off if you do and what is the expected value (EV) of that foul. Imagine the following situation: two average teams are playing on neutral ground with the score at 0-0 with M minutes left in the match. By using the information from part three of this series we could use this same process for a specific situation but for the sake of simplicity I will use the average case. The opposition striker has just beaten the offside trap and is through on goal in a clear goalscoring opportunity. You are the center back and again for the sake of simplicity let’s assume that you cannot win the ball off him fairly, your only options are to let him go and hope he doesn’t score or to foul him, give away a free kick or penalty and take the red card. Knowing what we know from the previous two articles we can estimate the value of letting him go and the value of fouling him to see which is the better option. Let’s say in this particular example there are fifteen minutes left in the match and you are outside the penalty area so by fouling you are giving away a free kick from a dangerous position. How often would a team score from the resulting free kick? It seems unlikely to me that it would be more than 10%. What if you let him go and he is 1-on-1 with the goalkeeper? He is surely a favourite to score but he won’t score every time. Let’s assume he scores 80% of the time. So in this example fouling is worth 0.43 goals in EGD. It’s worth noting that even though we are calcuting this in terms of goals, at the end of the day what we really care about are league points, and there are situations where looking at a situation in terms of goals and in terms of points can give different results. For example if instead of there being 15 minutes left in the match let’s say there is no time left and the referee will end the match as soon as the striker scores or misses from either open play or from the free kick after you foul him. Since there is no time left being down to ten men doesn’t have any effect so we can simply say that the EV of not fouling is -0.8 goals (the striker scores 80% of the time) and the EV of fouling is -0.1 goals (the team scores from the resulting free kick 10% of the time). So fouling is worth 0.7 goals. If the match is tied then the foul is also worth the same in league points, 0.7. But what if you are leading the match 1-0? In that case if you don’t foul the player 80% of the time he will score making it 1-1 and you will get 1 point from the match while 20% of the time he won’t and you will get 3 points for a total of 1.4 points. If you do foul the player 10% of the time you get 1 point and 90% of the time you get 3 points for a total of 2.8 points. So even though the goal value of a foul is 0.7 goals irregardless of whether the score is 0-0 or 1-0, the point value changes dramatically depending on the score. We can derive formulas for the EV of fouling when the match is tied and when you lead by one goal. So for example if you lead 1-0 in a situation where the value of a red card is -0.5 points and the opposition scores the resulting free kick 10% of the time EV(foul|lead) > 0 when y > 0.35, in other words if the opposition player scores from open play more than 35% of the time fouling is always going to be the better option. As another example if the match is tied in a situation where the value of a red card is -0.1 points and opposition scores the resulting penalty kick 75% of the time EV(foul|tied) < 0 when y < 0.85, in other words unless the opposition player scores from open play more often than 85% of the time letting him go will always be better than fouling. In an extreme case where the match is tied in a situation where the value of a red card is -1 point (for example right at the beginning of a match) and the opposition scores the resulting penalty kick 75% of the time EV(foul|tied) < 0 when y < 1.75, in other words letting him go is always correct even if he scores 100% of the time. where m is the team’s expected points if the opposition doesn’t score and n is the team’s expected points if the opposition does score. By using m = 3 and n = 1 we see that the equation is the same as EV(foul|lead) from before, and by using m = 1 and n = 0 the equation is the same as EV(foul|tied). Of course determining accurate m- and n-values in real world situations is difficult but the same basic method still applies. These are just a few examples and you can play around with the different variables to try out different scenarios. Naturally these calculations suffer from the same limitations as the red card calculations in the previous articles and there are some things we didn’t take into account like the fact that by taking the red card the player also receives a one or three match suspension which has some negative value and that sometimes (certainly not often, but there is a nonzero chance) the referee will go easy on you and only give you a yellow card, but to again quote George E. P. Box, “essentially, all models are wrong, but some are useful.” I think this is useful. This is part three in a series of posts investigating the value of a red card. One of the problems with the work presented in part two of this series is that the calculations were done for the average case, two average Premier League teams facing off on neutral ground with both teams having an expected goal differential of zero, and as such it isn’t directly applicable to the real world. However we can improve on the results and approximate the solutions to real world problems by tinkering with the inputs. But what about in a specific case? Take for example Manchester United. As you would expect United were quite a bit better than average at both scoring and conceding goals. If we plug these numbers into the EGD equation, assuming for now the ratios of goals scored and conceded 10vs11 to 11vs11 stay the same, we can see that the EGD of United playing 10vs11 for 90 minutes is -0.05 goals, whereas for the average team it would be -1.62 goals. That’s if we assume the ratios of goals scored and conceded stay the same, but one could argue that United are better at playing with ten men than the average team and so the ratios should be adjusted as well. Say you think United are 10% better at scoring goals 10vs11 and 10% better at conceding goals 10vs11 so we change the ratios from 0.72 and 1.98 to 0.8 and 1.8. Using the same goals scored and conceded per minute numbers with the new ratios the EGD of United playing 10vs11 for 90 minutes would be 0.24 goals. Now if you’re wondering how the value of a red card could be positive, remember that we aren’t calculating the value of a red card yet, we are calculating the expected goal differential of the team for the rest of the match. To determine the actual value of the red card we need to compare this figure with the team’s expected goal differential without the red card and the difference between the two is the value of the red card. I sort of glossed over this in the previous article because in the average case where the expected goal differential before the red card is zero it has no effect and the value of the red card is equal to the expected goal differential. So what is the EGD of United in different 11vs11 situations? Well, I don’t know. If I did I would be making millions betting on sports and not writing silly articles for a blog no one reads, but we can guess. Say United are at home against a bottom of the table side. It’s still scoreless and the second half has just begun when United have a player sent off. What is United’s EGD right before the sending off, after the sending off and what is the value of the red card? On average over the sample United scored 0.0215 goals per minute but at home against a weak side that number should be higher, let’s say it’s 0.03 goals per minute. On average over the sample United conceded 0.0081 goals per minute but at home against a weak side that number should be lower, let’s say it’s 0.006 goals per minute. So United’s EGD(11vs11) is 0.024 goals per minute or 1.08 goals for the remaining 45 minutes. After the red card, using the ratios of 0.8 and 1.8, United’s EGD(10vs11) is (0.03*0.8 – 0.006*1.8) * 45 = 0.594 goals. The value of the red card is the difference between the two, or EGD(10vs11) – EGD(11vs11) = -0.486 goals. We could also flip this example the other way and ask what is the value of the red card if the weaker away team receives it? Let’s say the bottom of the table team in this example is Wigan. On average over the sample Wigan scored 0.0111 and conceded 0.0160 goals per minute, but away at Old Trafford those numbers might be more like 0.0089 and 0.0192. Let’s also assume Wigan is worse than average at playing with ten men so instead of using the ratios of 0.72 and 1.98 we will use 0.6 and 2.2. Wigan’s EGD(11vs11) would then be -0.4635 goals and EGD(10vs11) would be -1.6605 goals. The value of the red card would be -1.197 goals. That a red card hurts a weaker team more than it does a stronger team shouldn’t come as much of a surprise. Whether you agree with the exact numbers I used in the examples is irrelevant. You can play with different situations and different inputs all day long, what matters is the method and understanding how to adapt the equation to whatever scenario you want to investigate. In part four of this series I will use this method to investigate the issue of intentional red card fouling. This is part two in a series of posts investigating the value of a red card. 1. The probability of a team scoring in any given minute is constant, in other words the probability that a team scores in the first minute is the same as the probability that a team scores in the last minute. In real life this isn’t strictly true, for example in the 09/10 Premier League season roughly 44% of all goals were scored in the first half compared to 56% in the second, but if we don’t assume it to be true the calculation quickly becomes impossible. 2. Once a red card has been given there are no more red cards for the rest of the match. Again this isn’t true but it happens so rarely that the effect it has on the final result is negligible. To include various 9vs11, 10vs10 and 9vs10 scenarios into the calculation would only add another layer of complexity with no tangible benefit. 1. How many goals per minute does the average team score when playing 11vs11? 2. How many goals per minute does the average team concede when playing 11vs11? 3. How does having to play 10vs11 affect how many goals per minute a team scores? 4. How does having to play 10vs11 affect how many goals per minute a team concedes? To answer these questions I went through every match from the 03/04 to 09/10 Premier League seasons collecting data on how many minutes a team had to play 10vs11 and how many goals they scored and conceded in that time. I then used that information together with the number of goals scored in total over the sample to calculate the average goals scored by a team per minute 11vs11 and 10vs11 as well as the average goals conceded by a team per minute 11vs11 and 10vs11. meaning the ratio of goals scored 10vs11 to 11vs11 was 0.72 and the ratio of goals conceded 10vs11 to 11vs11 was 1.98. The goals conceded ratio seems fairly straightforward. According to the data teams concede roughly twice as many goals when playing 10vs11 than they would playing 11vs11, which seems reasonable. The goals scored ratio is slightly more interesting. In my first draft of the calculation, before I had collected any data, I guessed that a team playing 10vs11 would score roughly half as many goals as they would playing 11vs11. One friend suggested that the ratio should be even lower, closer to 0.2 or 0.3. I was somewhat surprised to see the data suggest a ratio as high as 0.72. This could mean that there is a flaw in the data, or it could mean that there is a disconnect between reality and our predetermined notions of how much playing 10vs11 actually affects a team’s goal scoring. where M is the number of minutes remaining. You can try different numbers yourself but for example in the extreme case of having to play 90 minutes 10vs11 the EGD would be -1.62 goals. With fifteen minutes left the EGD would be -0.27 goals. With five minutes left -0.09 goals. To determine the value of the red card we need to calculate the difference between the EGD 10vs11 and the EGD 11vs11. Fortunately in the average case, since the EGD 11vs11 is zero for both teams, the value of the red card is equal to the EDG 10vs11 so we can use the above formula without having to worry about it. Clearly this method isn’t perfect, but as a starting point I think it can be valuable. To quote George E. P. Box, “essentially, all models are wrong, but some are useful.” Hopefully this is useful. In part three of this series I will look at ways to tinker with the model to make it more real world applicable. This is part one in a series of posts investigating the value of a red card. 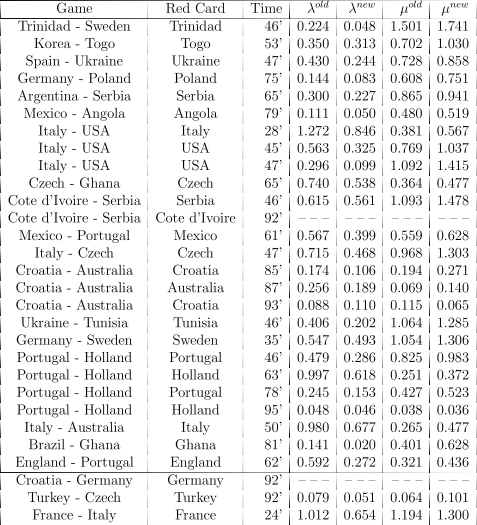 In an article published in the Journal of Quantitative Analysis in Sports entitled Estimating the Effect of the Red Card in Soccer: When to Commit an Offense in Exchange for Preventing a Goal Opportunity authors Jan Vecer, Frantisek Kopriva and Tomoyuki Ichiba analyse red card events from the 2006 World Cup and Euro 2008 and use in-match betting market data to attempt to quantify the value of a red card in terms of the effect it has on a team’s expected goal scoring rate. Their sample contained 26 matches from the World Cup and 3 matches from Euro 2008, of which 2 were discarded because the red card was awarded at the very end of the match, for a total sample of 27 matches. The complete list of matches along with time and recipient of the red card, as well as before and after goal scoring rates for both teams are given in Table 1. Table 1: Rates of scoring of the sanctioned and the opposing team immediately before and after the red card. From this data the authors derive the goal scoring rate for the sanctioned team and goal scoring rate for the opposing team ratios. They found that the goal scoring ratio of the sanctioned team is 0.663 and the goal scoring ratio of the opposing team is 1.237. In other words when a team receives a red card they score roughly two-thirds as many goals as they would have scored had the match continued 11vs11 and the opposing team scores (or equivalently the sanctioned team concedes) roughly five-fourths as many goals as they would have scored (conceded) had the match continued 11vs11. The method of using in-match betting market data is interesting and a useful alternative to methods used in previous studies (e.g. Ridder et al. (1994) and Bar-Eli et al. (2006)) attempting to quantify the value of a red card. Unfortunately for the authors the tiny sample size of red cards they use for their analysis makes any results they draw largely meaningless. 27 red card events is simply too small a sample size for us to put any weight in their findings. Before the results of this study can be trusted further work and a much larger sample size are needed. In part two of this series I will present my own work on the value of a red card based on data from past Premier League seasons.